Unique digital experience across the region. Telemach Slovenia, Telemach B&H and Telemach Montenegro, together with SBB Serbia are members of the United Group. All three are among leading cable operators in their countries, providing customers with TV, net and fixed telephony services. Telemach Slovenia provides mobile telephony as well, making it the only quadri-play provider in the United Group. We got immersed into Telemach adventure in 2015. The first to experience the digital transformation was Telemach Slovenia. A year after, the successful concept was applied to SBB, Telemach B&H and Telemach Montenegro. In 2015, Telemach acquired Tušmobil (Slovenian mobile operator) becoming the quadri-play operator, in real and in the digital world at the same time. After performing many market, brand, industry specific and internal software analysis the Telemach strategy for improvement of the digital presence was to put the great user experience in the focus, to harvest the best online possibilities hence positioning it as a powerful customer-oriented platform. Together with Telemach team, the extensive product catalogue of home services was optimized for web and made easily understandable to customers. Specific challenge we faced were various transmission technologies (coax, fiber, GPON, MMDS, satellite etc.) Telemach uses to deliver its services. Customers across Slovenia do not have the same possibilities regarding the service bundles, because different transmission infrastructure is available in different parts of country. In order to avoid order leads that cannot be completed due to location-based technology limitations, we introduced the footprint check, providing users with the tool to check what type of Telemach services are available based on their address. 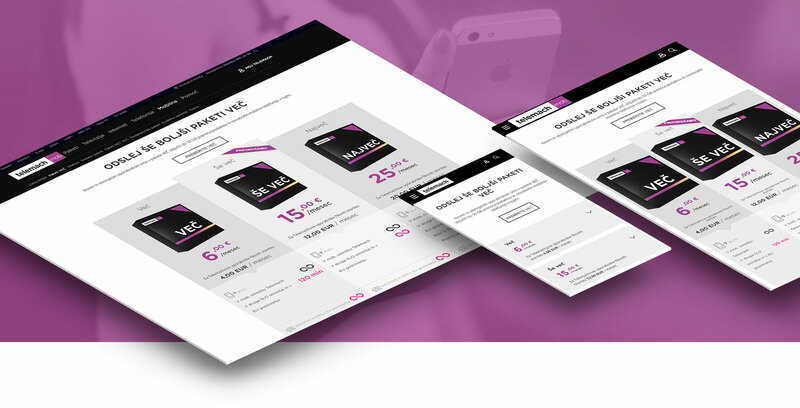 The new mobile offers containing only three mobile tariffs (VEČ) were added to Telemach portfolio. Our task was to present them to clients in an attractive and easy-to-discover way with an easy purchase option with or without mobile devices. Encouraging the transition of existing Tušmobil customers to Telemach mobile tariffs was another task specifically addressed by the website. Website as the pillar of whole digital presence. Website was and is still seen as the final station of each user searching for the Telemach brand in digital world. Whether customer starts his/her journey on social networks or in Google search he/she should land on website and find information or solution he/she is searching for. A customer oriented content strategy. 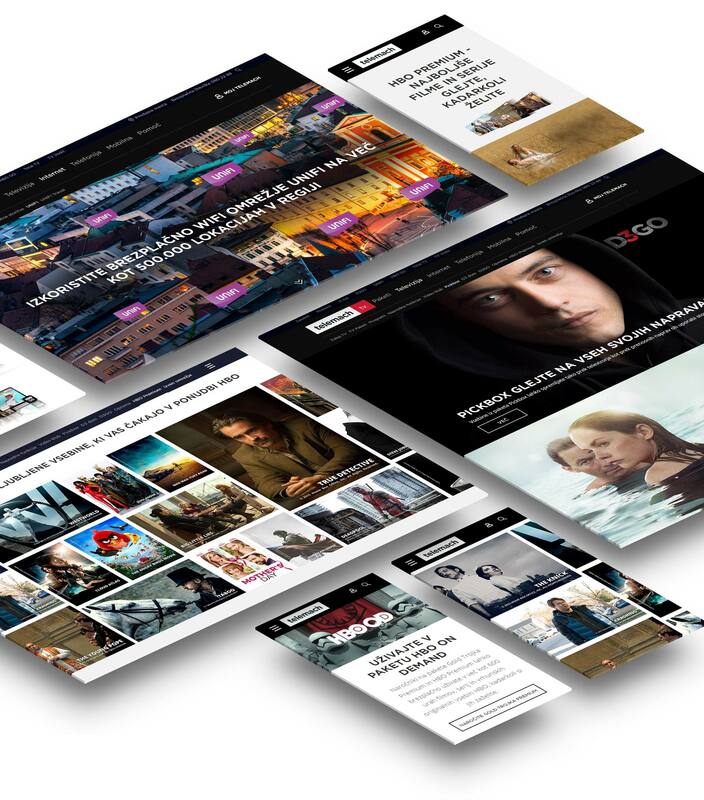 We introduced concept of sales-storytelling on Telemach website- the user flows were organized within the architecture to contain both current offers and upsells. Three types of pages were established as the base for storytelling and presentation concept: Promo pages, Product list pages and Product pages. Used for website homepage and homepages of each section (the “Why?” pages). They consisted of visually strong and informational banners with the main goal to attract users’ attention and drawn them into the story of Telemach products. We built a specific set of templates for promo banners which contain many different combinations of textual and visual presentations. At first, they were presented horizontally, one after another, but as industry trends moved to vertical packages presentation we responded agile to changes and restructured packages into vertical easily-comparable preview. Vertical packages preview facilitates comparison and positively affects decision making. They present information about specific package/product. These pages also went through the evolution - in the beginning, each package and device had its own product page but in order to optimize the purchasing process, the package product pages were removed and only usefull device product pages were left. The user flow starts on promo pages which lead him/her to product list page. On this page they compare different offers and make decision which product best meets their needs. Then, the users are encouraged to proceed to product specific page and to checkout pages. Online ordering introduced for all services. There was no checkout process on the previous Telemach website, while Tušmobil already had online purchasing for mobile tariffs and devices. Our task was to introduce two separated checkout processes on the website for mobile and for home services. Additionally, we addressed both the new and the existing customers who wanted to upgrade their services. Website set up as the dynamic Telemach shop. Website is treated equally as physical Telemach shops so we enabled publishing special promo offers that may be widely used or only web-based. We developed set of functionalities that support creation of promo discounts and gift promotions that apply to packages and provide customers with special benefits and reduce prices automatically. The possibility to easily change promo offers and to monitor success and effectiveness of each promotion was a clear benefit for Telemach. The workshops with Telemach team showed clearly the need for the improved Customer Section on the website. Main goals to accomplish were: decreasing the number of phone calls to official Telemach customer support phone line & Implementation of intuitive online customer support section that would address all customer's’ needs. We strongly believe in improvement based on data instead on assumptions. To support this idea, we implemented several advanced analytics tools and concepts such as Enhanced E-commerce which provides us with relevant information about users’ behaviour patterns in checkout process. Each month our teams conduct data analysis and make reports and recommendations for further improvements of the Telemach digital presence. MojTelemach - a personal space for customers. MojTelemach self care portal provides registered users with services and spendings overview, bills, access to Telemach OTT services etc. In order to clearly present concept of self care portal to Telemach customers and to encourage them to register, we created specific page that communicates benefits of self care portal and has login form embedded. Also, on other pages across website, we tend to funnel customers to self care portal. We created separated website section for business customers given the specifics of the offers that are different than for the residential users. We needed to meet the needs of both SMEs and corporations and according to that we introduced catered business sale-storytelling concept to this section, too. Based on WM proprietary Origami platform that provides numerous promo templates that host storytelling concept and also enabled product catalogue management and online purchasing process through its e-commerce module. See more about Origami platform at this link. Methodologies that helped us deliver such project of scale. The scrum methodology together with the continuous improvement approach led us to the successful completion of such project on time. The cooperation with client, strong involvement of product managers and product owners and fully planned sprints for developers kept the project in right focus. We simultaneously developed website and our platform to support all upcoming challenges in this huge-scope project. Data analysts and SEO experts are valuable on such project since they keep track of user flows and alarm in case of strange behavior patterns. We constantly monitor and analyze website analytics and perform A/B testing in order to improve purchasing process on the website. Following concept of continuous improvement we already launched renewed checkout process for home services to make user flows as smoothly and intuitive as possible. 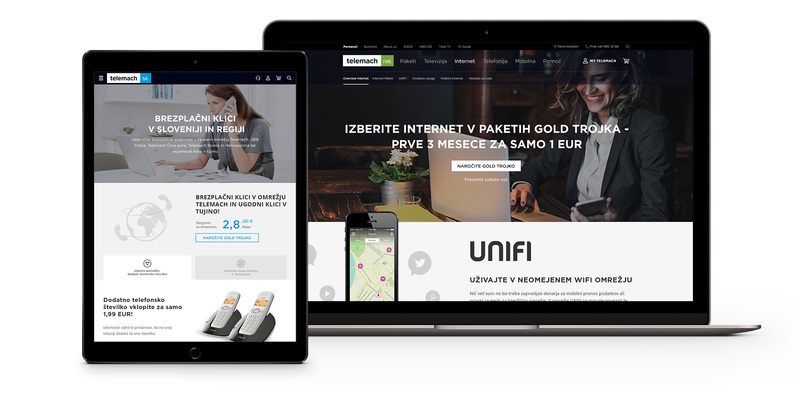 The concept was applied to upgrade of Telemach B&H and Telemach Montenegro websites.